A walkthrough and guide for the month of April in Persona 5. Included also are recommended activities for the protagonist and his confindants per day. In April, the Protagonist finds himself moving over to live with a family friend. While there, he gets to explore and meet new people. Despite his initial disinterest, he creates Social Links with new friends. When moving around Shibuya, you can explore and interact with different people. Here are the list Confidants available in April. You will be able to explore the first Palace this month. For a full walkthrough of the Kamoshida Palace, click here. You have a persona in your party matching the arcana of confidants you interact with. Having a persona of the confidant’s arcana allows you to rank up the Social Link much faster. You have Yen to throw around. You’re cocky enough to take on the palace the day after you found the infiltration route. DISCLAIMER: The information is also compiled also from our sister company: gamy.jp. Any similarities to other guides are coincidental. 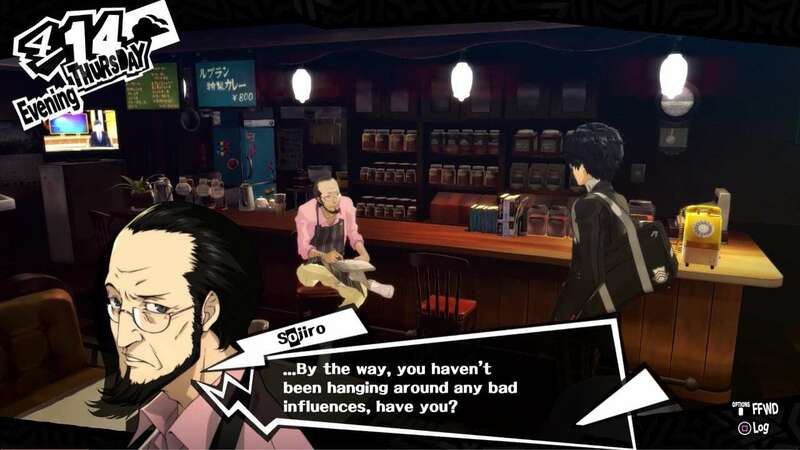 The Protagonist moves into Café Leblanc under the care of Sojiro Sakura. All you can do now is sleep. Sojiro and the Protagonist visit Shujin High School. Protagonist enrolls as a second-year student. A telephone call for Sojiro and the Protagonist flips Café Leblanc signage outside. The Protagonist’s supposedly first day of school. Glances on Ann Takamaki and meets Ryuji Sakamoto. Class Question Answer: Logic (Knowledge +1). Volleyball team practice at school. The Protagonist looks for witnesses to uncover Kamoshida’s abuses (2-D, 3-E, 1-B). Protagonist and Ryuji talk to Mishima. Ann talks with the Protagonist and Ryuji. Ann talks with Shiho Suzui in front of the vending machine. Morgana appears in the real world as a cat. Shiho sadly did the unfortunate. Head over to Takemi Medical Clinic. Remember this place well. If you max out the Death Confidant, the Protagonist will have access to a lot of useful items like an SP Adhesive with Invigorate 3. These are very helpful, especially in the long run. Head to the Airsoft Shop. When you get inside, you’ll come across Munehisa Iwai. On a personal note, we don’t suggest buying anything yet since there are weapons and armors that can drop in the palace that is way better than the equipment he sells. Ersatz Note: Visit the Airsoft Shop from time-to-time and buy weapons and armors for your under-geared party members. The Protagonist learns to craft particularly lockpicks. Always keep at least 5 of them on you. You’ll come across a lot of the treasure chests in a palace that requires lockpicks. These sometimes contain SP regen items which will definitely save your life. Head to the library and borrow The Pirate Legend (Captain Kidd) book. Part-Time Job system unlocked. Head over to Shibuya station and choose from one of the magazines. For this case, we suggest either getting the Flower Shop or the Convenience Store jobs. The Convenience Store doesn’t raise any stats but it does give you information for one of your later requests. The Flower Shop on the other hand grants +2 Kindness and 3,200 yen each time you work. You get a bonus if your customer particularly likes your flowers. Before tackling any of the jobs, do buy Plant Nutrients. Every 16 days, you can feed your plant some Plant Nutrients to get an easy +2 Kindness. There are times it can give you a +3, as well. This is especially important for certain Confidants later on. Buy crafting materials at Yongen-Jaya Recycling Shop. This makes it easy to craft lockpicks. That way, you won’t have to miss any items on your first run through a palace. The store’s stock is random, so check every time you have the chance. Head to Takemi Medical Clinic and meet Takemi Tae. Death Confidant will be acquired. Best the Protagonist max Death Confidant out, as she gives good items that can help with SP consumption. Spending time with Takemi usually grants +1 to Guts. Spend time with Ryuji. Chariot Confidant is now acquired. Chariot Confidant Rank 2 with Ryuji. Talk to the customers to make them leave Cafe Leblanc. That way, you can either study in one of the booths or read a book at the bar. Head to the library to exchange the Captain Kidd book for the Zorro book. Prepare healing items and check character equipment. Finalize the infiltration of Kamoshida Palace. Reach the treasure room. On a personal note, we always deal with the boss right after I finish the infiltration. That way, we block out one of the possible bad endings. Besides, you have more room for your stats and social confidants this way. Make sure you have your lockpicks. That way, you won’t miss any locked chests. This is far better than relying on that godforsaken batting cage for Proficiency. Not only do you sharpen your proficiency, but you also produce useful items for infiltrations. Our suggestion: make a lot of Lockpicks, Stealthanol, and Goho-M. Kick Kamoshida to the curb and change his heart. Class Question: Singing (Knowledge +1). Spend time with Ryuji Sakamoto. Spend time with Sojiro Sakura (Hierophant Confidant Start). This confidant needs a certain level of kindness to progress later on. Once you reach Rank 6, you will have access to a number of useful items to help with SP consumption. There are a lot of things you can do today. Sell your stuff from the Palace and buy new equipment at the Airsoft Shop. Made your way to the Diner to kick up a Stat. Watch a movie at Shibuya Theater (Guts +3). Buy from the Drink Stand at the Underground Walkway (Beauty Aojiru for +Charm). Note: Special drinks from the Drink Stand is only available every Sunday, so be sure to check it out because it can boost your stats. Either read the Zorro book (Kindness) or study (Knowledge) in the booth. It’s a toss-up between Knowledge and Kindness. Read on the train: Zorro book (+3 Kindness). If you hadn’t started the book yet, you can finish it this evening. Class Question: Knowing your actions are wrong / Conviction that you’re right. (Knowledge +1). Exchange Zorro book for Carmen book (if you finished). Spend time with Tae Takemi (Guts +1). Spend 500 yen in the Bath House (+2/+3 Charm). This would work better if it were raining. However, there’s also a chance that it’ll buff your Guts instead. Take note of the SP Drinks from Vending Machine near the Bath House. It restocks every week and you can purchase 2 per restock. Note: Ryuji’s status varies if (A) You have a chariot arcana persona, (B) You’ve been constantly trying to rank up his Social Link, (C) you haven’t been spending time with him at all. Train on how to make Coffee at Café Leblanc. Note: This is especially helpful when you’re running dungeons. A majority of the coffee heals SP. Most of all, this also helps in raising your Social Links should one of them want to hang out with you. Spend time with Ryuji Sakamoto at Ogikubo. When doing this, Ogikubo appears on the map and you guys can go get Monjayaki. You can also invite people here later to increase your Social Link with them. Sometimes, another confidant will appear in that area making it a double whammy of Social Link points. Spend time with Sojiro Sakura. Greetings! This is Ersatz from Samurai Gamers. We’ve just updated this Persona 5 game guide article just recently. Hope it is much better from your playing experience. If there are things that we weren’t able to add, please don’t hesitate to post your comments or feedback in general. Thank you again on behalf of SG! I have no idea how a starting character would be able to finish the castle in one day. I ran out of SP about a third of the way through, and physical attacks take way too long to be effective. Other than that this guide is very thorough and helpful, though. Tried this guide but on April 20 only reached halfway before running out of SP. So my calendar days got messup. I usually use more physical attacks than SP-consuming skills to have an easier time. It should get you at least to finish the infiltration.